Menachem Begin (Hebrew: מְנַחֵם בֵּגִין Menaḥem Begin ( listen (help·info)); Polish: Mieczysław Biegun; Russian: Менахем Вольфович Бегин Menakhem Volfovich Begin; 16 August 1913 – 9 March 1992) was an Israeli politician, founder of Likud and the sixth Prime Minister of Israel. Before the creation of the state of Israel, he was the leader of the Zionist militant group Irgun, the Revisionist breakaway from the larger Jewish paramilitary organization Haganah. He proclaimed a revolt, on 1 February 1944, against the British mandatory government, which was opposed by the Jewish Agency. As head of the Irgun, he targeted the British in Palestine. Later, the Irgun fought the Arabs during the 1947–48 Civil War in Mandatory Palestine. Begin’s most significant achievement as Prime Minister was the signing of a peace treaty with Egypt in 1979, for which he and Anwar Sadat shared the Nobel Prize for Peace. In the wake of the Camp David Accords, the Israel Defense Forces (IDF) withdrew from the Sinai Peninsula, which was captured from Egypt in the Six-Day War. Later, Begin’s government promoted the construction of Israeli settlements in the West Bank and the Gaza Strip. Begin authorized the bombing of the Osirak nuclear plant in Iraq and the invasion of Lebanon in 1982 to fight PLO strongholds there, igniting the 1982 Lebanon War. As Israeli military involvement in Lebanon deepened, and the Sabra and Shatila massacre, carried out by Christian Phalangist militia allies of the Israelis, shocked world public opinion, Begin grew increasingly isolated. As IDF forces remained mired in Lebanon and the economy suffered from hyperinflation, the public pressure on Begin mounted. Depressed by the death of his wife Aliza in November 1982, he gradually withdrew from public life, until his resignation in October 1983. 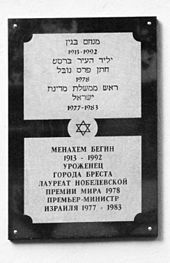 Menachem Begin was born to Zeev Dov and Hassia Biegun in what was then Brest-Litovsk in the Russian Empire (today Brest, Belarus). He was the youngest of three children. On his mother's side he was descended from distinguished rabbis. His father, a timber merchant, was a community leader, a passionate Zionist, and an admirer of Theodor Herzl. The midwife who attended his birth was the grandmother of Ariel Sharon. After a year of a traditional cheder education Begin started studying at a "Tachkemoni" school, associated with the religious Zionist movement. In his childhood, Begin, like most Jewish children in his town, was a member of the Zionist scouts movement Hashomer Hatzair. He was a member of Hashomer Hatzair until the age of 13, and at 16, he joined Betar. At 14, he was sent to a Polish government school, where he received a solid grounding in classical literature. Begin studied law at the University of Warsaw, where he learned the oratory and rhetoric skills that became his trademark as a politician, and viewed as demagogy by his critics. During his studies, he organized a self-defense group of Jewish students to counter harassment by anti-Semites on campus. He graduated in 1935, but never practiced law. At this time, he became a disciple of Vladimir "Ze'ev" Jabotinsky, the founder of the nationalist Revisionist Zionism movement and its Betar youth wing. His rise within Betar was rapid: At 22, he shared the dais with his mentor at the Betar World Congress in Kraków. The pre-war Polish government actively supported Zionist youth and paramilitary movements. Begin's leadership qualities were quickly recognised. In 1937 he was the active head of Betar in Czechoslovakia and became head of the largest branch, that of Poland. As head of Betar's Polish branch, Begin traveled among regional branches to encourage supporters and recruit new members. To save money, he stayed at the homes of Betar members. During one such visit, he met his future wife Aliza Arnold, who was the daughter of his host. 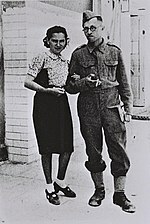 On 29 May 1939 the couple married. They had three children: Binyamin, Leah and Hassia. In September 1939, after Germany invaded Poland, Begin, in common with a large part of Warsaw's Jewish leadership, escaped to Wilno (today Vilnius), then eastern Poland, to avoid inevitable arrest. The town was soon occupied by the Soviet Union, but from 28 October 1939, it was the capital of the Republic of Lithuania. Wilno was a predominately Polish and Jewish town; an estimated 40 percent of the population was Jewish, with the YIVO institute located there. As a prominent pre-war Zionist and reserve status officer-cadet, on 20 September 1940, Begin was arrested by the NKVD and detained in the Lukiškės Prison. He wrote about his experience of being tortured, in later years. He was accused of being an "agent of British imperialism" and sentenced to eight years in the Soviet gulag camps. On 1 June 1941 he was sent to the Pechora labor camps in Komi Republic, the northern part of European Russia, where he stayed until May 1942. Much later in life, Begin would record and reflect upon his experiences in the interrogations and life in the camp in his memoir White Nights. In July 1941, just after Germany attacked the Soviet Union, and following his release under the Sikorski–Mayski agreement because he was a Polish national, Begin joined the Free Polish Anders' Army as a corporal officer cadet. He was later sent with the army to Palestine via the Persian Corridor, where he arrived in May 1942. Upon arriving in Palestine, Begin, like many other Polish Jewish soldiers of the Anders' Army, faced a choice between remaining with the Anders' Army to fight Nazi Germany in Europe, or staying in Palestine to fight for establishment of a Jewish state. While he initially wished to remain with the Polish army, he was eventually persuaded to change his mind by his contacts in the Irgun, as well as Polish officers sympathetic to the Zionist cause. Consequently, General Michał Karaszewicz-Tokarzewski, the second in command of the Army issued Begin with a "leave of absence without an expiration" which gave Begin official permission to stay in Palestine. In December 1942 he left Ander's Army and joined the Irgun. During the Holocaust, Begin's father was among the 5,000 Brest Jews rounded up by the Nazis at the end of June 1941. Instead of being sent to a forced labor camp, they were shot or drowned in the river. His mother and older brother Herzl also died in the Holocaust. Begin had studied the Irish War of Independence and the Indian independence movement, and, while planning the rebellion with Irgun commanders, devised a strategy of leverage he believed would force the British out. He proposed a series of guerrilla attacks that would humiliate the British and damage their prestige, which would force them to resort to repressive measures, which would in turn alienate the Yishuv. Begin banked on the international media being attracted to the action, which he referred to as turning Palestine into a "glass house", with the world looking in. This would draw international attention, and British repression would create global sympathy for the Irgun's cause, which in turn would translate into political pressure on Britain. Ultimately, the British would be forced to choose between continued repression or withdrawal, and Begin was certain that in the end, the British would leave. Furthermore, so as not to disturb the war effort against Germany, only British government and police targets would be attacked at first, while military targets would only be attacked once Germany had been defeated. On 1 February 1944, the Irgun proclaimed a revolt. Twelve days later, it put its plan into action when Irgun teams bombed the empty offices of the British Mandate's Immigration Department in Jerusalem, Tel Aviv, and Haifa. The Irgun next bombed the Income Tax Offices in those three cities, followed by a series of attacks on police stations in which two Irgun fighters and six policemen were killed. Meanwhile, Lehi joined the revolt with a series of shooting attacks on policemen. Throughout 1944, the Irgun and Lehi attacks intensified. These operations were financed by demanding money from Jewish merchants and engaging in insurance scams in the local diamond industry. In 1944, after Lehi gunmen assassinated Lord Moyne, the British Resident Minister in the Middle East, the official Jewish authorities, fearing British retaliation, ordered the Haganah to undertake a campaign of collaboration with the British. Known as The Hunting Season, the campaign seriously crippled the Irgun for several months, while Lehi, having agreed to suspend the campaign, was spared. Begin, anxious to prevent a civil war, ordered his men not to retaliate or resist being taken captive, convinced that the Irgun could ride out the Season, and that the Jewish Agency would eventually side with the Irgun when it became apparent the British government had no intention of making concessions. Gradually, shamed at participating in what was viewed as a collaborationist campaign, the enthusiasm of the Haganah began to wane, and Begin's assumptions were proven correct. The Irgun's restraint also earned it much sympathy from the Yishuv, whereas it had been assumed before by many that it had placed its own political interests before those of the Yishuv. The fragile partnership collapsed following the bombing, partly because contrary to instructions, it was carried out during the busiest part of the day at the hotel. The Haganah, from then on, would rarely mount attacks against British forces and would focus mainly on the Aliyah Bet illegal immigration campaign, and while it occasionally took half-hearted measures against the Irgun, it never returned to full-scale collaboration with the British. The Irgun and Lehi continued waging a full-scale insurgency against the British, and together with the Haganah's illegal immigration campaign, this forced a large commitment of British forces to Palestine that was gradually sapping British financial resources. 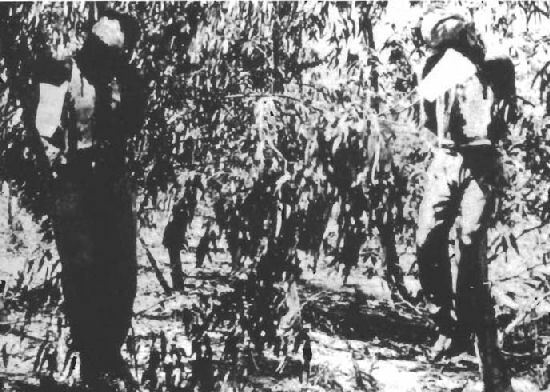 Three particular Irgun operations directly ordered by Begin: the Night of the Beatings, the Acre Prison break, and the Sergeants affair, were cited as particularly influencing the British to leave due to the great loss of British prestige and growing public opposition to Britain remaining in Palestine at home they generated. In September 1947, the British cabinet voted to leave Palestine, and in November of that year, the United Nations approved a resolution to partition the country between Arabs and Jews. The financial burden imposed on Britain by the Jewish insurgency, together with the tremendous public opposition to keeping troops in Palestine it generated among the British public was later cited by British officials as a major factor in Britain's decision to evacuate Palestine. In December 1947, immediately following the UN partition vote, the 1947-48 Civil War in Mandatory Palestine broke out between the Yishuv and Palestinian Arabs. The Irgun fought together with the Haganah and Lehi during that period. Notable operations in which they took part were the battles of Jaffa and the Jordanian siege on the Jewish Quarter in the Old City of Jerusalem. The Irgun's most controversial operation during this period, carried out alongside Lehi, was an assault on the Arab village of Deir Yassin in which more than a hundred villagers and four of the attackers were killed. The event later became known as the Deir Yassin massacre, though Irgun and Lehi sources would deny a massacre took place there. Begin also repeatedly threatened to declare independence if the Jewish Agency did not do so. Throughout the period of the rebellion against the British and the civil war against the Arabs, Begin lived openly under a series of assumed names, often while sporting a beard. Begin would not come out of hiding until April 1948, when the British, who still maintained nominal authority over Palestine, were almost totally gone. During the period of revolt, Begin was the most wanted man in Palestine, and MI5 placed a 'dead-or-alive' bounty of £10,000 on his head. Begin had been forced into hiding immediately prior to the declaration of revolt, when Aliza noticed that their house was being watched. He initially lived in a room in the Savoy Hotel, a small hotel in Tel Aviv whose owner was sympathetic to the Irgun's cause, and his wife and son were smuggled in to join him after two months. He decided to grow a beard and live openly under an assumed name rather than go completely into hiding. He was aided by the fact that the British authorities possessed only two photographs of his likeness, of which one, which they believed to be his military identity card, bore only a slight resemblance to him, according to Begin, and were fed misinformation by Yaakov Meridor that he had had plastic surgery, and were thus confused over his appearance. Due to the British police conducting searches in the hotel's vicinity, he relocated to a Yemenite neighborhood in Petah Tikva, and after a month, moved to the Hasidof neighborhood near Kfar Sirkin, where he pretended to be a lawyer named Yisrael Halperin. After the British searched the area but missed the street where his house was located, Begin and his family moved to a new home on a Tel Aviv side street, where he assumed the name Yisrael Sassover and masqueraded as a rabbi. Following the King David Hotel bombing, when the British searched the entire city of Tel Aviv, Begin evaded capture by hiding in a secret compartment in his home. In 1947, he moved to the heart of Tel Aviv and took the identity of Dr. Yonah Koenigshoffer, the name he found on an abandoned passport in a library. In the years following the establishment of the State of Israel, the Irgun’s contribution to precipitating British withdrawal became a hotly contested debate as different factions vied for control over the emerging narrative of Israeli independence. Begin resented his being portrayed as a belligerent dissident. After the Israeli Declaration of Independence on 14 May 1948 and the start of the 1948 Arab–Israeli War, Irgun continued to fight alongside Haganah and Lehi. On 15 May 1948, Begin broadcast a speech on radio declaring that the Irgun was finally moving out of its underground status. On 1 June Begin signed an agreement with the provisional government headed by David Ben Gurion, where the Irgun agreed to formally disband and to integrate its force with the newly formed Israel Defense Forces (IDF), but was not truthful of the armaments aboard the Altalena as it was scheduled to arrive during the cease-fire ordered by the United Nations and therefore would have put the State of Israel in peril as Britain was adamant the partition of Jewish and Arab Palestine would not occur. This delivery was the smoking gun Britain would need to urge the UN to end the partition action. Begin had meanwhile boarded the Altalena, which was headed for Tel Aviv where the Irgun had more supporters. Many Irgun members, who joined the IDF earlier that month, left their bases and concentrated on the Tel Aviv beach. A confrontation between them and the IDF units started. In response, Ben-Gurion ordered Yigael Yadin (acting Chief of Staff) to concentrate large forces on the Tel Aviv beach and to take the ship by force. Heavy guns were transferred to the area and at four in the afternoon, Ben-Gurion ordered the shelling of the Altalena. One of the shells hit the ship, which began to burn. Yigal Allon, commander of the troops on the shore, later claimed only five or six shells were fired, as warning shots, and the ship was hit by accident. There was danger that the fire would spread to the holds which contained explosives, and Captain Monroe Fein ordered all aboard to abandon ship. People jumped into the water, whilst their comrades on shore set out to meet them on rafts. Although Captain Fein flew the white flag of surrender, automatic fire continued to be directed at the unarmed survivors swimming in the water. Begin, who was on deck, agreed to leave the ship only after the last of the wounded had been evacuated. 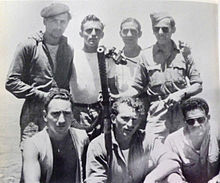 Sixteen Irgun fighters were killed in the confrontation with the army (all but three were veteran members and not newcomers in the ship); six were killed in the Kfar Vitkin area and ten on Tel Aviv beach. Three IDF soldiers were killed: two at Kfar Vitkin and one in Tel Aviv. About a year later, Altalena was refloated, towed 15 miles out to sea and sunk. In August 1948, Begin and members of the Irgun High Command emerged from the underground and formed the right-wing political party Herut ("Freedom") party. The move countered the weakening attraction for the earlier revisionist party, Hatzohar, founded by his late mentor Ze'ev Jabotinsky. Revisionist 'purists' alleged nonetheless that Begin was out to steal Jabotinsky's mantle and ran against him with the old party. The Herut party can be seen as the forerunner of today's Likud. In November 1948, Begin visited the US on a campaigning trip. During his visit, a letter signed by Albert Einstein, Sidney Hook, Hannah Arendt, and other prominent Americans and several rabbis was published which described Begin's Herut party as "terrorist, right-wing chauvinist organization in Palestine," "closely akin in its organization, methods, political philosophy and social appeal to the Nazi and Fascist parties" and accused his group (along with the smaller, militant, Stern Gang) of preaching "racial superiority" and having "inaugurated a reign of terror in the Palestine Jewish community". 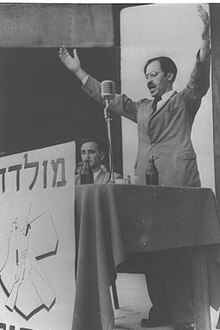 In the first elections in 1949, Herut, with 11.5 percent of the vote, won 14 seats, while Hatzohar failed to break the threshold and disbanded shortly thereafter. This provided Begin with legitimacy as the leader of the Revisionist stream of Zionism. During the 1950s Begin was banned from entering the United Kingdom, as the British government regarded him as "leader of the notorious terrorist organisation Irgun"
Between 1948 and 1977, under Begin, Herut and the alliances it formed (Gahal in 1965 and Likud in 1973) formed the main opposition to the dominant Mapai and later the Alignment (the forerunners of today's Labor Party) in the Knesset; Herut adopted a radical nationalistic agenda committed to the irredentist idea of Greater Israel that usually included Jordan. During those years, Begin was systematically delegitimized by the ruling party, and was often personally derided by Ben-Gurion who refused to either speak to or refer to him by name. Ben-Gurion famously coined the phrase 'without Herut and Maki' (Maki was the communist party), referring to his refusal to consider them for coalition, effectively pushing both parties and their voters beyond the margins of political consensus. One of the fiercest confrontations between Begin and Ben-Gurion revolved around the Reparations Agreement between Israel and West Germany, signed in 1952. Begin vehemently opposed the agreement, claiming that it was tantamount to a pardon of Nazi crimes against the Jewish people. While the agreement was debated in the Knesset in January 1952, he led a demonstration in Jerusalem attended by some 15,000 people, and gave a passionate and dramatic speech in which he attacked the government and called for its violent overthrow. Referring to the Altalena Affair, Begin stated that "when you fired at me with cannon, I gave the order; 'Don't [return fire]!' Today I will give the order, 'Do!'" Incited by his speech, the crowd marched towards the Knesset (then at the Frumin Building on King George Street) and threw stones at the windows, and at police as they intervened. After five hours of rioting, police managed to suppress the riots using water cannons and tear gas. Hundreds were arrested, while some 200 rioters, 140 police officers, and several Knesset members were injured. Many held Begin personally responsible for the violence, and he was consequently barred from the Knesset for several months. His behavior was strongly condemned in mainstream public discourse, reinforcing his image as a provocateur. The vehemence of Revisionist opposition was deep; in March 1952, during the ongoing reparations negotiations, a parcel bomb addressed to Konrad Adenauer, the sitting West German Chancellor, was intercepted at a German post office. While being defused, the bomb exploded, killing one sapper and injuring two others. Five Israelis, all former members of Irgun, were later arrested in Paris for their involvement in the plot. Chancellor Adenauer decided to keep secret the involvement of Israeli opposition party members in the plot, thus avoiding Israeli embarrassment and a likely backlash. 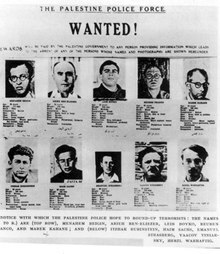 The five Irgun conspirators were later extradited from both France and Germany, without charge, and sent back to Israel. Forty years after the assassination attempt, Begin was implicated as the organizer of the assassination attempt in a memoir written by one of the conspirators, Elieser Sudit. In the following years, Begin failed to gain electoral momentum, and Herut remained far behind Labor with a total of 17 seats until 1961. In 1965, Herut and the Liberal Party united to form the Gahal party under Begin’s leadership, but failed again to win more seats in the election that year. In 1966, during Herut's party convention, he was challenged by the young Ehud Olmert, who called for his resignation. Begin announced that he would retire from party leadership, but soon reversed his decision when the crowd pleaded with him to stay. The day the Six-Day War started in June 1967, Gahal joined the national unity government under Prime Minister Levi Eshkol of the Alignment, resulting in Begin serving in the cabinet for the first time, as a Minister without Portfolio. Rafi also joined the unity government at that time, with Moshe Dayan becoming Defense Minister. Gahal's arrangement lasted until August 1970, when Begin and Gahal quit the government, then led by Golda Meir due to disagreements over the Rogers Plan and its "in place" cease-fire with Egypt along the Suez Canal, Other sources, including William B. Quandt, note that the Labor party, by formally accepting UN 242 in mid-1970, had accepted "peace for withdrawal" on all fronts, and because of this Begin had left the unity government. On 5 August, Begin explained before the Knesset why he was resigning from the cabinet. He said, "As far as we are concerned, what do the words 'withdrawal from territories administered since 1967 by Israel' mean other than Judea and Samaria. Not all the territories; but by all opinion, most of them." As Prime Minister, Begin presided over various reforms in the domestic field. Tuition fees for secondary education were eliminated and compulsory education was extended to the tenth grade, while new social programmes were introduced such as long-term care insurance and a national income support system. A ban on color television that had been imposed to enforce social equality was abolished, and the minimum age for a driver's license was lowered to 17. Another government program initiated, named "Project Renewal", was aimed at rehabilitating impoverished towns and neighborhoods. Inhabited mainly by Sephardi and Mizrahi immigrants and their descendants, these areas were characterized by slum conditions and substandard housing. The project was a joint effort between the Israeli government, Jewish Agency, and Jewish communities worldwide, which provided much of the funding for it. The program was directly administered through the Prime Minister's Office until 1981, when Begin's government transferred responsibility to the Ministry of Housing. Extensive work was done to eliminate slum conditions in these areas, and to improve the general quality of life. Physical infrastructure such as roads, sewage and drainage systems, and street lighting was upgraded, tens of thousands of housing units were renovated and expanded, and hundreds of public service facilities such as community centers, early childhood development centers, day centers for the elderly, playgrounds, and educational and healthcare facilities were built or renovated. By 1983, the program had touched over 450,000 people in 82 towns and neighborhoods. The program continued past Begin's premiership, and switched towards other vulnerable populations. Project Renewal is still being implemented today for at-risk communities in Israel. Begin's economic policies sought to liberalize Israel's socialist economy towards a more free-market approach, and he appointed Simha Erlich as Finance Minister. Erlich unveiled a new economic policy that became known as the "economic transformation". Under the new plan, the exchange rate would from then on be determined by market forces rather than the government, subsidies for many consumer products were cancelled, foreign exchange controls were eased, the VAT tax was raised while the travel tax was cancelled, and customs duties were lowered to encourage imports of more products. The plan generated some improvement; cheap and high-quality imported products began to fill consumer shelves, the business sector benefited greatly, and the stock market recorded rising share prices. However, the program did not improve the lives of the Israeli people as Begin had hoped. The combination of the increased VAT, the end of subsidies, and a rise in the U.S. dollar exchange rate set off a wave of inflation and price increases. In particular, the fact that government spending was not significantly reduced in tandem with the liberalization program triggered a massive bout of inflation. On 17 July 1978, the Israeli cabinet met to discuss rising inflation, but Begin, declaring that "you cannot manage economics over the housewife's back", halted all proposals. In the end, the government decided not to take any actions and allow inflation to ride its course. Begin and his other ministers did not internalize the full meaning of the liberalization plan. As a result, he blocked attempts by Erlich to lower government spending and government plans to privatize public-sector enterprises out of fear of harming the weaker sectors of society, allowing the privatization of only eighteen government companies during his six-year tenure. In 1983, shortly before Begin's resignation, a major financial crisis hit Israel after the stocks of the country's four largest banks collapsed and were subsequently nationalized by the state. Inflation would continue rapidly rising past Begin's tenure, and was only brought under control after the 1985 Israel Economic Stabilization Plan, which among other things greatly curbed government spending, was introduced. The years of rampant inflation devastated the economic power of the powerful Histadrut labor federation and the kibbutzim, which would help Israel's approach towards a free-market economy. Begin's government has been credited with starting a trend that would move Israel towards a capitalist economy that would see the rise of a consumer culture and a pursuit of wealth and higher living standards, replacing a culture that scorned capitalism and valued social, as well as government restrictions to enforce equality. In terms of social justice, however, the legacy of the Begin Government was arguably a questionable one. In 1980, the state Social Security Institute estimated that from 1977 to 1980 the number of babies born in poverty doubled, while there had been a 300% increase in the number of families with four to five children below the poverty line. Additionally, the number of families with more than five children below the poverty line went up by 400,% while child poverty estimates suggested that from 1977 to 1981 the number of children living below the poverty line had risen from 3.8% to 8.4%, while officials at the National Institute of Insurance estimated that the incidence of poverty had doubled during Begin’s five years in office. In 1978 Begin, aided by Foreign Minister Moshe Dayan and Defense Minister Ezer Weizman, came to Washington and Camp David to negotiate the Camp David Accords, leading to the 1979 Egypt–Israel Peace Treaty with Egyptian President, Anwar Sadat. Before going to Washington to meet President Carter, Begin visited Rabbi Menachem M. Schneerson for his advice. Under the terms of the treaty, brokered by US President, Jimmy Carter, Israel was to hand over the Sinai Peninsula in its entirety to Egypt. The peace treaty with Egypt was a watershed moment in Middle Eastern history, as it was the first time an Arab state recognized Israel's legitimacy whereas Israel effectively accepted the land for peace principle as blueprint for resolving the Arab–Israeli conflict. Given Egypt’s prominent position within the Arab World, especially as Israel's biggest and most powerful enemy, the treaty had far reaching strategic and geopolitical implications. Begin was less resolute in implementing the section of the Camp David Accord calling for Palestinian self-rule in the West Bank and Gaza Strip. He appointed Agriculture Minister Ariel Sharon to implement a large scale expansion of Jewish settlements in the Israeli-occupied territories, a policy intended to make future territorial concessions in these areas effectively impossible. Begin refocused Israeli settlement strategy from populating peripheral areas in accordance with the Allon Plan, to building Jewish settlements in areas of Biblical and historic significance. When the settlement of Elon Moreh was established on the outskirts of Nablus in 1979, following years of campaigning by Gush Emunim, Begin declared that there are "many more Elon Morehs to come." During his term dozens of new settlements were built, and Jewish population in the West Bank and Gaza more than quadrupled. Begin took Saddam Hussein's anti-Zionist threats seriously and therefore took aim at Iraq, which was building a nuclear reactor named Osirak or Tammuz 1 with French and Italian assistance. When Begin took office, preparations were intensified. Begin authorized the construction of a full-scale model of the Iraqi reactor which Israeli pilots could practice bombing. Israel attempted to negotiate with France and Italy to cut off assistance and with the United States to obtain assurances that the program would be halted. The negotiations failed. Begin considered the diplomatic option fruitless, and worried that prolonging the attack would lead to a fatal inability to act in response to the perceived threat. The decision to attack was hotly contested within Begin's government. However, in October 1980, the Mossad informed Begin that the reactor would be fueled and operational by June 1981. This assessment was aided by reconnaissance photos supplied by the United States, and the Israeli cabinet voted to approve an attack. In June 1981, Begin ordered the destruction of the reactor. On 7 June 1981, the Israeli Air Force destroyed the reactor in a successful long-range operation called Operation Opera. Soon after, the government and Begin expounded on what came to be known as the Begin Doctrine: "On no account shall we permit an enemy to develop weapons of mass destruction (WMD) against the people of Israel." Begin explicitly stated the strike was not an anomaly, but instead called the event "a precedent for every future government in Israel"; it remains a feature of Israeli security planning policy. Many foreign governments, including the United States, condemned the operation, and the United Nations Security Council unanimously passed Resolution 487 condemning it. The Israeli left-wing opposition criticized it also at the time, but mainly for its timing relative to domestic elections only three weeks later, when Likud was reelected. The new government annexed the Golan Heights and banned the national airline from flying on Shabbat. Public dissatisfaction reached a peak in September 1982, after the Sabra and Shatila Massacre. Hundreds of thousands gathered in Tel Aviv in what was one of the biggest public demonstrations in Israeli history. The Kahan Commission, appointed to investigate the events, issued its report on 9 February 1983, found the government indirectly responsible for the massacre but that Defense Minister Ariel Sharon "bears personal responsibility." The commission recommended that Sharon be removed from office and never serve in any future Israeli government. Initially, Sharon attempted to remain in office and Begin refused to fire him. But Sharon resigned as Defense Minister after the death of Emil Grunzweig, who was killed by a grenade tossed into a crowd of demonstrators leaving a Peace Now organized march, which also injured ten others, including the son of an Israeli cabinet minister. Sharon remained in the cabinet as a minister without portfolio. Public pressure on Begin to resign increased. Begin’s disoriented appearance on national television while visiting the Beaufort battle site raised concerns that he was being misinformed about the war’s progress. Asking Sharon whether PLO fighters had ‘machine guns’, Begin seemed out of touch with the nature and scale of the military campaign he had authorized. Almost a decade later, Haaretz reporter Uzi Benziman published a series of articles accusing Sharon of intentionally deceiving Begin about the operation’s initial objectives, and continuously misleading him as the war progressed. Sharon sued both the newspaper and Benziman for libel in 1991. The trial lasted 11 years, with one of the highlights being the deposition of Begin's son, Benny, in favor of the defendants. Sharon lost the case. Argentine journalist Hernan Dobry has alleged that during this time Begin also ordered an airlift of weapons to Argentina during the Falklands War, because he still hated the British decades after fighting them in the 1940s, and wanted to avenge the hanging of his friend Dov Gruner. However the weapons arrived after the war had already ended. Begin subsequently retired to an apartment overlooking the Jerusalem Forest and spent the rest of his life in seclusion. He would rarely leave his apartment, and then usually to visit his wife's grave-site to say the traditional Kaddish prayer for the departed. His seclusion was watched over by his children and his lifetime personal secretary Yechiel Kadishai, who monitored all official requests for meetings. Begin would meet almost no one other than close friends or family. After a year, he changed his telephone number due to journalists constantly calling him. He was cared for by his daughter Leah and a housekeeper. According to Kadishai, Begin spent most of his days reading and watching movies, and would start and finish a book almost every day. He also kept up with world events by continuing his lifelong habit of listening to the BBC every morning, which had begun during his underground days, and maintaining a subscription to several newspapers. Begin retained some political influence in the Likud party, which he used to influence it behind the scenes. On 3 March 1992, Begin suffered a severe heart attack in his apartment, and was rushed to Ichilov Hospital, where he was put in the intensive care unit. Begin arrived there unconscious and paralyzed on the left side of his body. His condition slightly improved following treatment, and he regained consciousness after 20 hours. For the next six days, Begin remained in serious condition. Begin was too frail to overcome the effects of the heart attack, and his condition began to rapidly deteriorate on 9 March at about 3:15 AM. An emergency team of doctors and nurses attempted to resuscitate his failing heart. His children were notified of his condition and immediately rushed to his side. Begin died at 3:30 AM. His death was announced an hour and a half later. Shortly before 6:00 AM, the hospital rabbi arrived at his bedside to say the Kaddish prayer. Begin's funeral took place in Jerusalem that afternoon. His coffin was carried four kilometers from the Sanhedria Funeral Parlor to Mount of Olives in a funeral procession attended by thousands of people. In accordance with his wishes, Begin was given a simple Jewish burial ceremony and buried on the Mount of Olives in the Jewish Cemetery there. He had asked to be buried there instead of Mount Herzl, where most Israeli leaders are laid to rest, because he wanted to be buried beside his wife Aliza, as well as Meir Feinstein of Irgun and Moshe Barazani of Lehi, who committed suicide in jail while awaiting execution by the British. An estimated 75,000 mourners were present at the funeral. Prime Minister Yitzhak Shamir, President Chaim Herzog, all cabinet ministers present in Israel, Supreme Court justices, Knesset members from most parties and a number of foreign ambassadors attended the funeral. 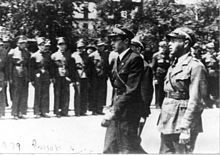 Former members of the Irgun High Command served as pallbearers. A slightly fictionalized Menachem Begin appeared in the first edition of Land of Black Gold, but was removed from subsequent editions. He appears in the film Waltz with Bashir, the techno-thriller novel The Fifth Horseman by Larry Collins and Dominique Lapierre, and the science fiction novel Worldwar: Volume 4: Striking the Balance by Harry Turtledove. Begin was played by David Opatoshu in the 1977 TV film Raid on Entebbe and by Barry Morse in the 1983 miniseries Sadat. Chris Claremont, longtime writer of the X-Men comic book, has said that Begin reminds him of the character Magneto. ^ John J. Mearsheimer and Stephen M. Walt, The Israel Lobby and U.S. Foreign Policy, at 102 (Farrar, Straus and Giroux 2007). ^ Gwertzman, Bernard. Christian Militiamen Accused of a Massacre in Beirut Camps; U.S. Says the Toll is at Least 300 Archived 2 March 2014 at the Wayback Machine. The New York Times. 19 September 1982. ^ Thompson, Ian. Primo Levi: A Life. 2004, page 436. ^ Lehmann-Haupt, Christopher (19 November 1984). "Books Of The Times". The New York Times. ^ "Museum - מרכז מורשת מנחם בגין". ^ Ahronovitz, Esti (22 February 2012). "Begin's Legacy / The Man Who Transformed Israel" – via Haaretz. ^ Haber, Eitan (1978). Menahem Begin: The Legend and the Man. New York: Delacorte. ^ a b "menachem begin". Archived from the original on 4 March 2016. ^ Haber, Eitan (1978). Menachem Begin: The Legend and the Man. New York: Delacorte Press. ISBN 0-440-05553-9. ^ Yehuda Bauer, From Diplomacy to Resistance: A history of Jewish Palestine, Jewish Publication Society of America, Philadelphia, 1970 p.325. ^ In his book ‘The Revolt’ (1951), Begin outlines the history of the Irgun’s fight against British rule. ^ Silver, Eric (1984) Begin: A Biography. Weidenfeld and Nicolson, ISBN 0-297-78399-8. Page 107. ^ Morris, 1948, p272: "Altogether eighteen men died in the clashes, most of them IZL". Katz, Days of Fire (an Irgun memoir), p247: 16 Irgun, 2 Hagana. Perliger, Jewish Terrorism in Israel, p27: 16 Irgun and 2 Hagana. ^ Koestler, Arthur (First published 1949) Promise and Fulfilment – Palestine 1917–1949 ISBN 0-333-35152-5. Page 249 : "About forty people had been killed in the fighting on the beaches, on board the ship, or while trying to swim ashore." ^ Netanyahu, Benjamin (1993) A Place among the Nations – Israel and the World. British Library catalogue number 0593 034465. Page 444. "eighty-two members of the Irgun were killed." ^ "Menachem Begin (1913-1992)". www.knesset.gov.il. ^ Schuster, Ruth (4 December 2014). "'This Day in Jewish History / N.Y. Times publishes letter by Einstein, other Jews accusing Menachem Begin of fascism". Haaretz. ^ "The Gun and the Olive Branch" p 472-473, David Hirst, quotes Lilienthal, Alfred M., The Zionist Connection, What Price Peace?, Dodd, Mead and Company, New York, 1978, pp.350–3 – Albert Einstein joined other distinguished citizens in chiding these `Americans of national repute' for honoring a man whose party was `closely akin in its organization, methods, political philosophy and social appeal to the Nazi and Fascist parties'. See text at Harvard.edu and image Archived 4 July 2009 at the Wayback Machine. Verified 5 December 2007. ^ Einstein had already publicly denounced the Revisionists in 1939; at the same time Rabbi Stephen Wise denounced the movement as, "Fascism in Yiddish or Hebrew." See Rosen, Robert N., Saving the Jews: Franklin D. Roosevelt and the Holocaust, Thunder's Mouth Press, New York, 2006, p. 318. ^ Oren, Amir (7 July 2011). "British Documents Reveal: Begin Refused Entry to U.K. in 1950s" – via Haaretz. ^ Colin Shindler (2002). The Land Beyond Promise: Israel, Likud and the Zionist Dream. I. B. Tauris. pp. xviii, 45, 57, 87. ^ Policy Implementation of Social Welfare in the 1980s By Frederick A. Lazin. Google Books. ^ "Social Security Programs Throughout the World: Asia and the Pacific, 2010 - Israel". www.ssa.gov. ^ Public Policy in Israel By David Nachmias and Gila Menachem. Google Books. ^ a b c d "Article Iphone View Element". www.haaretz.com. ^ Discord in Zion: Conflict Between Ashkenazi and Sephardi Jews in Israel G. N. Giladi, 1990. Google Books. ^ Dery, David (11 November 2013). "Data and Policy Change: The Fragility of Data in the Policy Context". Springer Science & Business Media – via Google Books. ^ Avner, Yehuda (2010). The Prime Ministers: An Intimate Narrative of Israeli Leadership. The Toby Press. pp. 551–563. ISBN 978-1-59264-278-6. ^ Perry, Dan. Israel and the Quest for Permanence. McFarland & Co Inc., 1999. p. 46. ^ "El-Al, Israel's Airline". Gates of Jewish Heritage. Archived from the original on 22 February 2001. ^ Schiff, Ze'ev; Ehud, Yaari (1984). Israel's Lebanon War. Simon & Schuster. ISBN 0-671-47991-1. ^ "'A deep-rooted hatred of the British': How Israelis 'armed junta' in Falklands conflict". Daily Mail. London. 20 April 2011. ^ "'A deep-rooted hatred of the British': How Israelis 'armed junta' in Falklands conflict". ^ "The Telegraph - Google News Archive Search". news.google.com. ^ "Ottawa Citizen - Google News Archive Search". news.google.com. ^ "Yom Ha'atzmaut, Israel Independence Day". Jewish Holidays. ^ "The good jailer – Israel News-Haaretz Daily Newspaper". ^ "The Unknown TINTIN". www.oocities.org. ^ "The Arab World and the Middle East". ^ Foege, Alec. "The X-Men Files". New York Magazine. Retrieved 23 September 2012. Wikimedia Commons has media related to Menachem Begin. (in Russian) About the future Begin Monument in Brest, Belarus, Vecherniy Brest, Brest, Belarus. This page was last edited on 7 March 2019, at 01:25 (UTC).